You know how the first time you see an architect’s scale model it really grabs you, the perfect detail, the way it plays with your sense of scale, of reality. For Stuart, this was when he was 15, on work experience at his local council. Of course he’d seen model railways and villages, but there’s something precise and idealistic about an architect’s model. Then in Taiwan recently we saw an architect’s model of the gallery in which the model sat. We could almost imagine we saw tiny models of ourselves peering at a model of the model, and so on to infinity. It wasn’t until seeing the recent show by Calum Stirling at the new Vivid project space in Digbeth that we started thinking about how they represent a kind of fractal extrapolation of signs. 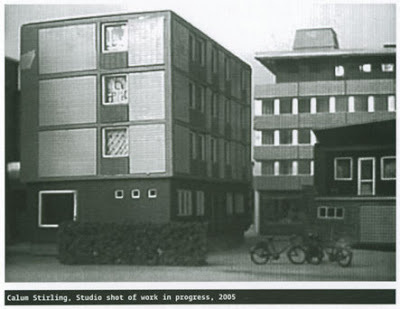 The key piece in the show was a model of a city commercial district on a revolving platform in a locked office. 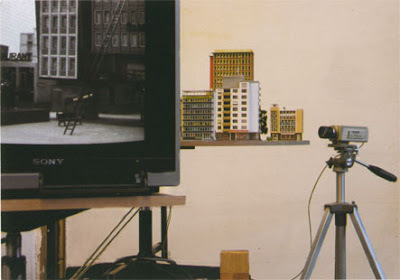 The model could be viewed through a window, but also via an old black and white CCTV set up back projected in the main space. Together with the accompanying music, the piece took on the feel of an atmospheric, European film – an impression reinforced by the German signage on all of the model shops. There was other work in the show: a wall piece made from Renault radiator grill badges (The project space used to be an MOT/Tyre outfit); a video of fire hydrants; a wooden model of a Laptop; wood and metal constructions resembling seating; and a lightbox covered in a piece made from plastic bags. Although there were connections to be made between all of the works, they almost became a distraction from the strength of the signature piece. This video installation had a particular resonance in this space. Because of the current regeneration of Digbeth into part of the “East Side” development, the model represents all architects’ models in such areas of development and the video projection becomes a stage of magnification on way up to the scale of the city itself. Oddly, while walking away from the show into town, we looked in a barber’s shop window and saw a model of the shop in the window, with toy chairs and images cut out from magazines. I swear, if we looked from the right angle, we could see ourselves looking through the window.